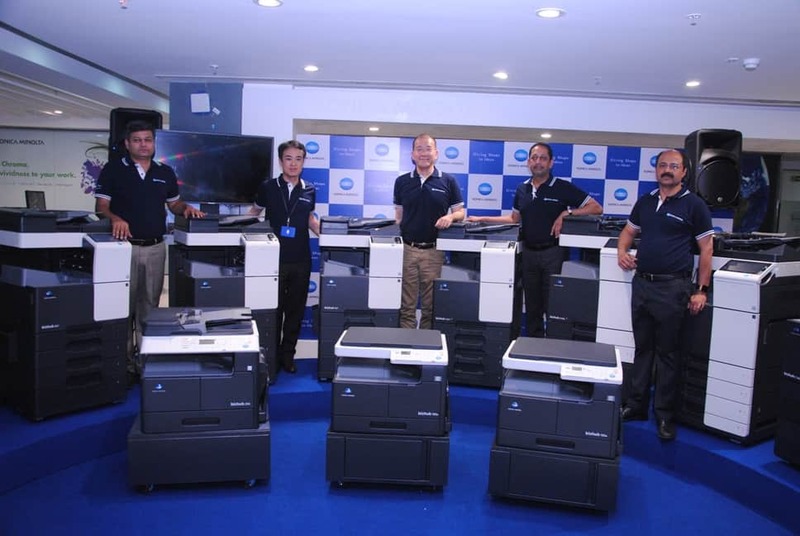 Adding to its existing product lines, Konica Minolta, renowned for its world-leading digital printing technology today announced the launch of bizhub 165e/185e, bizhub 206/226, bizhub 227/287/367, bizhub C227, bizhub C368 / C308/ C258 series of color & monochrome Multi-functional products (MFP-print, copy, scan and fax all in one system). Adopting Konica Minolta’s award-winning INFO-Palette design for multi-touch functionality, these latest MFPs include a variety of new features to increase productivity, overall versatility and energy savings. Konica Minolta’s newest bizhub models are most ideal for small- to medium-sized business environments and offer productivity to match user workflow. The bizhub series features compact & lightweight with powerful functions packed into 3-in-1 design that allows simple operability through one touch buttons. Approximately 51% of MFP main body are made by recycled materials- PC/ABS and biomass plastic. Hence, the bizhub series are always the top priority in environmental contribution. To protect valuable information, this series also incorporates advanced security features like authentication on the MFP main unit, IC card authentication, biometric authentication, TPM (Trusted Platform Module) etc. Furthermore, the series offers Konica Minolta’s exclusive Emperon® print system for built-in print control and the next-generation Simitri® HD toner formulation for sharp, clear images. Konica Minolta also announced the launch of bizhub PRO 1100, a monochrome production printer. The bizhub PRO 1100 has a lot to offer: new applications and functions, a faster turnaround time, a colour scanner and a flexible Open API interface – all helping to handle the wide variety of frequently changing on-demand jobs of internal and external print shops. It can handle the demands of any production environment. With a maximum paper capacity of 9,000 sheets in five cassettes and the new bypass tray MB-507, the monochrome printer is well equipped for any high-volume job, and even extensive mixed-media jobs can be handled easily. The monochrome printer has an outstanding output quality. Such quality is based on a number of outstanding technological features: a genuine resolution of 1200 x 1200 dpi, a unique screening technology and customized tone curve adjustments thanks to a tone curve utility.